Today I had a meeting with the Product Manager of Quark Express 8. Its been a long time since I’ve had the pleasure of using clunky Quark, since they got lazy with updates Adobe jumped in with InDesign and have pretty much consumed the market ever since. 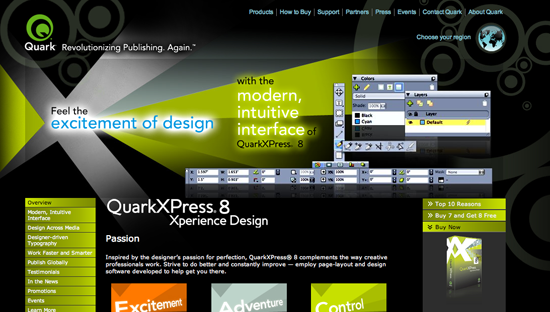 Pockets of publishing house still use Quark 7 but InDesign is now seen as the standard software for DTP. But is that about to change with Quark Express 8? In short Quark8 impressed the hell out of me, enough for me to download the free trial and start whacking out pages. So what does it have of interest? Aside from its easy usability that made Quark so significant first time round, it is chock full of interactive elements that quite frankly InDesign CS3 lacks. Quark have made what looks to be a good bridge between print and online publishing. From what I can tell Quark8 is a good little product for people that want to do basic website interactivity and animation along with a top of the range print design programme. Is it going to replace Flash? Not a chance, web designers will always use their package of choice, and Q8 wont be that. But that’s not what they are trying to accomplish, they are going after the modern publishing market that deals in both print and web, someone that can make a magazine and an accompanying website with ease, and more importantly (for money spinners) with less staff. of html coding this can be uploaded to an ftp and heh presto, you’ve got an online magazine. It really is that easy, Quark have made a programme that enables people to make fully interactive digital magazines. There are limitations however, the Flash coding is not as efficient as Flash itself and you dont have the wide range of tools and options that Flash can provide, but Flash cant be used for layout design either so its 6 of one and half a dozen of the other. As with all things good design is the key, with Quark8 a single good designer could design, animate, interact with and publish a digital magazine that could easily compete with current releases, and that is a major step in the right direction. It may not be taken onboard by major publishers for titles like iGizmo, but it will mean smaller companies with less resources can produce eZines of just as good quality. Ill be using Quark8 quote a lot in the next few weeks so I’ll be sure to post a better idea of it’s eZine capabilities.